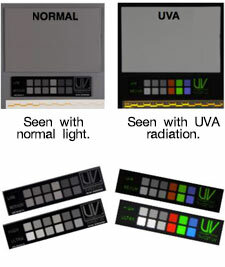 This target set includes one Target UV-Gray™ (4” x 6”) for field-of-view white balance and one double sided Target-UV™ in-line target (5” x 1.25”) with four different levels of fluorescence intensity. PECA 918 (IR cut) and Wratten 2e (UV cut) are required filters for most cameras. * Not suitable for use with UVB or UVC.